The River Tamar to the west of Plymouth marks the boundary between the rest of England and the County of Cornwall, which was once an independent Kingdom of Cornwall. While the last King of Cornwall died in the Tenth Century and the County ultimately became part of the United Kingdom, the Cornish identity is recognised today through the Duchy of Cornwall - presided over by the Duke of Cornwall (otherwise known as the Prince of Wales). West Cornwall has one of the most concentrated collections of ancient monuments in Europe, all within an ancient landscape that has changed very little since the Celtic Iron Age 2,500 years ago. Neolithic-Bronze Age granite-walled tombs and monuments from over 5,000 years ago stand isolated on the inspiring moorland. There are legends that the Phoenicians, traders and explorers from the coastal area of Syria, reached St. Michael's Mount and used the area as a centre for trade. While direct evidence supporting these stories is scarce, it is likely that early Mediterranean peoples landed and traded with the Cornish and it is known that the ancient Romans traded with Cornwall particularly for copper and tin, using the harbour of St Michael’s Mount. Cornwall is a Celtic region - with a background similar to the Welsh, Scots and Irish and also the Breton (in north-western France). A fiercely independent people, the Cornish value their heritage and actively seek to preserve all that is best of it. Through its Celtic roots, Cornwall had its own language - similar to Welsh and Gaelic but quite distinct from the Saxon languages which became today’s English. The Cornish language continued in use long after the end of the Cornish Kingdom, through the Middle Ages, and was last spoken regularly in the late 1700s. It is still spoken today in the form of revived Cornish. In 1595, Penzance, Newlyn and Mousehole were invaded, sacked and burned by a Spanish raiding fleet in the aftermath of their ill-fated Armada and only a few Medieval and Tudor buildings survived this experience. While these invaders were soon despatched, this event marked the last time England was ever invaded by hostile forces. Penzance can boast a proud commercial history marked by the granting of a charter for the harbour in 1512 by King Henry VIII. By 1614, the damage caused by the Spanish invasion was repaired and Penzance was rebuilt and King James I granted the town a Charter of Incorporation. During the English Civil War in the mid-1600s, the town was again plundered, but its Charter was confirmed by King Charles II in 1663. During that year it also became a coinage town, reflecting its commercial importance in relation to the great mining era which peaked during the 19th century. 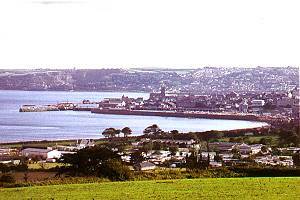 Life in Penzance and West Cornwall traditionally centred around the basic industries of agriculture, fishing and mining and many local families can trace their West Cornwall ancestry back for many hundreds of years. As these industries reduced their needs in employment over the years, many people emigrated overseas particularly to countries such as Australia, South Africa, Canada and the USA, with a major exodus in the late 1800s when mining for tin and copper declined. From these emigrants come many of today’s visitors to Penzance as they seek the restoration of links with their heritage. Amongst the historically important citizens of the town was Sir Humphry Davy (1778-1829), a notable scientist who was born in Penzance, and invented the miners safety lamp in 1801. This was one of the most significant contributions to safety at work in gaseous mines.